We appreciate the generous support of PennDesign, as well as the University of Pennsylvania's Provost's office “Year of Water” grant program. 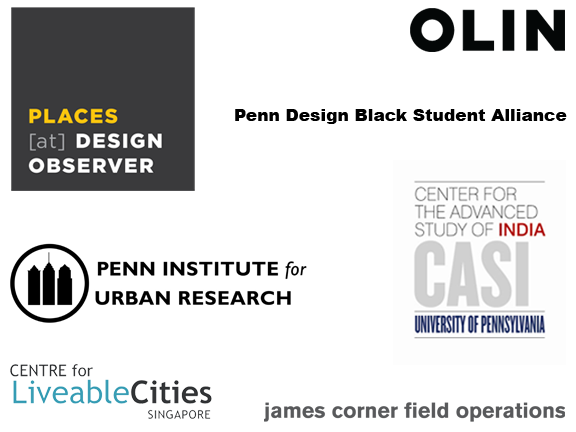 We are very grateful to the Centre for Liveable Cities for their presenting sponsorship, as well as, OLIN, James Corner Field Operations, Penn Institute for Urban Research, Center for the Advanced Study of India, and Penn Design Black Student Alliance for their support. Our media partner, Places, has been instrumental in promoting this event. We are especially grateful to the following donors for their substantial support: Barbara van Beuren and Stephen L. Glascock, Bonnie and Gary Sellers, Barbara and Gary N. Siegler, and Ed Friedrichs III.